The 1918 Pandora yearbook for Sanford High School. 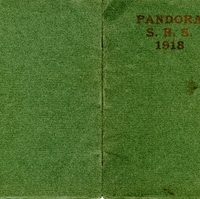 1918 was the only year that Sanford High published its yearbook under the name Pandora. Due to World War I, the 1918 yearbook staff published a pamphlet version of a yearbook in an effort to save materials. The pamphlet was named Pandora, deviating from the traditional Salmagundi, to honor this special issue. Edna F. Chittenden was the editor-in-chief of the 1918 Pandora. It has 20 pages, and does not feature any advertisements. Topics of interest include student writings, such as "How The Present European War Has Affected The Position of Women." Other features of the 1918 Pandora are poetry, locals and socials, a class history, and statistics. Original yearbook: Pandora, Vol. I, No. 1 (Sanford, FL: Literary and Debating Societies, 1918): Sanford High School Collection, box 1, Pandora 1918, UCF Public History Center, Sanford, Florida. Digital reproduction of original yearbook: Pandora, Vol. I, No. 1 (Sanford, FL: Literary and Debating Societies, 1918). Sanford High School Collection, box 1, Pandora 1918, UCF Public History Center, Sanford, Florida. “Pandora, Vol. I, No. 1, 1918.” RICHES of Central Florida accessed April 19, 2019, https://richesmi.cah.ucf.edu/omeka/items/show/3926.